One of the purposes and ministries of the Holy Spirit is to convict the world through the believer that the “ruler of this world” has been judged. I laugh at surveys and polls which suggest that most people don’t believe in a real devil. In reality you can’t poll the world on the reality of the devil. Scripture reminds us Satan “blinds the minds of the unbelieving.” Polls only tell us Satan has done his job…effectively. Unfortunately, believers have bought this Kool-Aid and drunk it down with gusto. We forget about the devil, just like we forget about Christ and His finished work on the cross. The Holy Spirit has been given to us to remind us just what has happened to the devil. He has been judged! What difference does it make in your life knowing and believing the devil has been judged? Everything! The key to victory in spiritual warfare is in knowing both what Jesus Christ has done to Satan and what He has done to you. 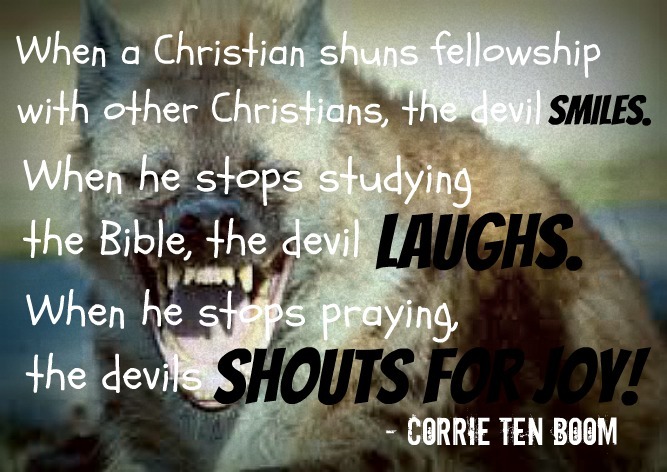 Christians too often live in fear of what they think the devil might do, but can’t, and in ignorance of what they themselves can do, but don’t. Defeat is thus the result of failing to reckon with and act upon the devil’s dethronement and the believer’s enthronement. Listen, there have been numerous times in my ministry when I have had to back Satan down and proceeded to drive him out of someone’s life. In most of these situations… I didn’t want to be there. I stood on the ground that Satan had been judged and he was defeated. My hair may have been standing on-end, my skin might have been crawling and my flesh wanted to run the other way. On these occasions I could feel the Holy Spirit well-up inside me, giving me the boldness of a warrior. In those moments… defeat was not an option. I stood because I knew I could enforce the victory Christ won centuries earlier. The word “destroy” means to loose, to unbind, to unravel, or dissolve. Hence, Satan’s works are conceived as chains that bind us, which Jesus breaks. The enemy is a master weaver. His works have a coherence, an inter-connectedness, of somehow being intertwined, as if a tapestry of art. We must remember Jesus came to undo and dissolve all the enemy’s efforts to bind people. Knowing Jesus and walking in the truth of His resurrected power makes us fellow liberators with Him. Morally, he entices one to sin. Physically, he inflicts disease (and death). Intellectually, he seduces into error. Socially, he provokes hatred and chaos. Politically and Economically, he produces injustice and oppression. Spiritually, he blinds the minds of unbelievers lest they believe the gospel. Praise the Lord, the old ruler of this world has been judged. The Holy Spirit reminds us again and again that Satan has been defeated and we need to live as victors, not as those who are defeated.